Day 2 in the City of Love! 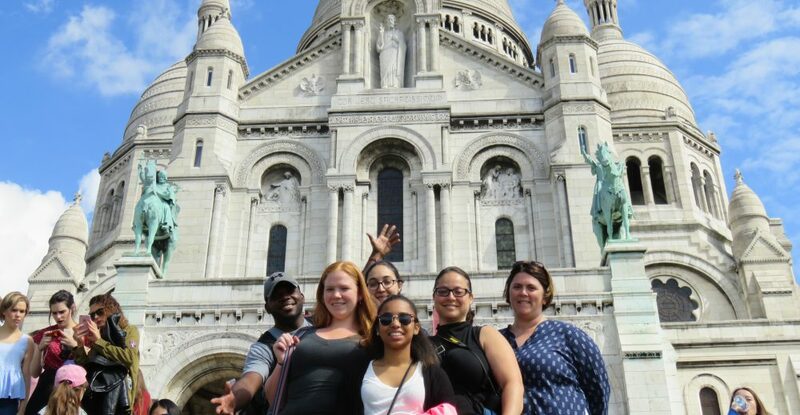 Almost oozing with excessive love for the magical city and a desire to know of everything Parisian, we were all ready to dive right into the beautifully preserved history of the city in an open bus tour aptly called the Paris Grand Tour. Our day obviously started with a walk along the Seine stopping occasionally for bits of information about monuments and fountains that came along the way. For example, we learned that the word l’hotel is a multifaceted word in French, doubling as a word for a hotel and a hospital, and its meaning depends on the context it is being used for in the sentence. We made our way through the maze of underground train lines to Opera where we were supposed to board the bus. Interestingly, we learned of the confusing yet super-fast and extremely integral to the Parisian train system called the RER. It is represented with a letter as opposed to a number used to represent the various metro lines and runs along East-West and North-South of Paris. The bus tour came to an end after two hours of historical immersion and we bid adieu to our professors. We had the evening free to continue our exploration of the city. 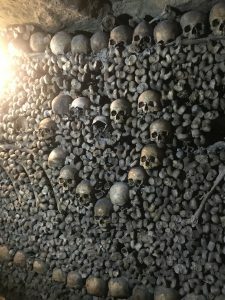 An impromptu plan of going to the interestingly infamous Catacombs of Paris was made by the group totally disregarding the long queue and aimless waiting hours that lie ahead of us. We made our way to the closest metro stop to the Catacombs using our newly acquired knowledge of the RER system. For some of us, long queue meant an opportunity to meet and interact with fellow Catacomb-explorers from all over the world while for others, it presented an excellent opportunity to just sit in the grass and think of nothing and everything, breathing the Parisian air. Talk about making the best out of something (or nothing)! It is beyond one’s imagination to think that the beautiful city of love harbors something as horrific and spooky as the Catacombs built into what were earlier old quarries. Taking 132 steps and twenty meters under, we were transferred to a cool (in all sense of the word, the temperature is 58 degrees) and dark-twisted tunnelway of the ossuary that was lined with bones of nearly six million Parisians arranged in an artistic manner, keeping in line with everything else Parisian. It is a unique site that is definitely to be experienced once if you happen to be in the city! Paris is meant to fall in love- with the city, its beauty, its history, its haute couture, and of course, with the Parisians (albeit having a terribly snobbish and self-obsessed reputation). Until next time, onto next day! A bientot! This entry was posted in Uncategorized by aditikrishna_srivastava@student.uml.edu. Bookmark the permalink.